I don't know if it's just summer and I am so tired of all the heat or the fact that this really is a small house. But I am constantly obsessing about wide open cool spaces. I just NEED some, or else the look of some. Living in the desert, we won't cool down until October, and then it will be around 80. Being housebound has me feeling squeezed in. This was the LR with the area rug and the ottoman in place. Cozy look, but I am in the mood for wide open spaces. I removed the area rug and took the ottoman out and it seemed to open the space up a lot. I think hardwood floors would also give the room a more airy look, but that's not going to happen any time soon, so the carpet is here to stay. Now I love my drapes and I will continue to use them probably for years, however, how about a change. Can you envision some simple cream silk drapes? I think the room could use a little bit of shine. Something in an off white that will just frame the windows, but maybe fade into the walls a little bit. Ok, I need your opinions!!!! What's going to make this seem and feel more open? I did see some cream antique satin lined drapes on clearance at Bed-Bath & Beyond for $10 a panel, however they only had 3 panels left and I couldn't find anymore. I could make some, however if I find some on sale, then that saves a ton of work. I am ready for something, so tell me what you think. maybe try taking 2 dinning room chairs away from your table and does it have extensions ? take one out . Richard here from, My Old Historic House. First of all your room is beautiful. I think one thing I would change is the placement of the wing chair. Mybe put the other two arm chairs where it is, with the smallest table between them. A lamp on it. It is hard to tell, but like it is not a big room. 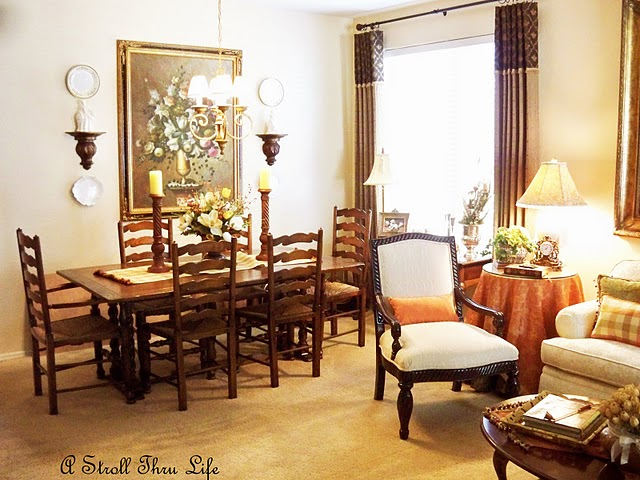 Can you pull the wing chair back from the dining area and over to the side. You might want to not use the one end table and go to a small drinks table instead. Or a garden seat. The space thing is coming from that one chair by the dining room set. That area is very close. I would also, if you can, or want to, pick another coffee table. Maybe a tea table height and smaller and square or round. Or two little drinks tables instead. The coffee table seems very big. I think you could use one half the size. Or maybe use the ottaman with a tray instead. Good luck. Thanks for sharing. And be sure and drop by my Blog for a free give away this week. I love the way it looks now. Is that okay? Your house looks wonderful I just think you need to go out for the day, have some lunch with girlfriends & go shopping. I have fist dibs on your curtains if you decide to get rid of them! I agree with the others, your house looks wonderful! Maybe what Janice said, about downsizing your dining rm table if you can and taking out a couple of chairs?? Other than that, go with what Mercy said....have a play day! I am! Going out today with my friend to see "The Help" and then fabric shopping! Have fun Marty with your lightening up...I am sure it will be gorgeous as always! I think a piece of painted furniture to replace a wooden piece might perk it up a bit. To me, one piece of painted furniture in a room is like an exclamation point. I like it how it is now too! LOL I know thats not much help. I did see someone mentioned removing 2 of the dining room chairs I'd try that out and see how it looks. I'll let you keeps your butter slab...I just bought myself one for my early birthday present! You have done a beautiful job of decorating your home; however, sometimes we just want to shake things up a bit. I like the idea of taking some of the dining chairs away. Have you considered an upholstered bench on the long side of the table? I've pinned a couple of examples if you go to my Pinterest boards. I love the bench idea because it gives you some open space instead of all those chair parts. I also love your curtains; however, if curtains are the same color as the wall, they blend in seamlessly. Marty, I have felt exactly as you've expressed it. Summer is weighing heavily in the south and seems to last longer each year. I'm not enjoying anything that looks heavy and dark. People have always changed seasonal looks, rolled up rugs and putting them away, etc. so I think the idea of changing draperies for a while would be light and refreshing. I also like the idea of a piece of painted furniture.Rooms can just look to woody sometime.I have recently put away two dining chairs in a closet and wondered why I didn't think of it before. I know you'll make beautiful changes because your home already reflects that you do. Love your blog and I'm an avid follower. Marty, I think your home looks like it could be straight out of a magazine! I like all the changes you have made so far. One thing I read once about making a room to appear larger is to allow the eye to see the base boarding across the room. So in that respects I would move the wing back chair in the corner. I also love many of the suggestions shared by your other readers. Marty - I think home always looks wonderful. I believe you are just ready for some cooler weather. I don't live in the desert, but it sure been a long, hot summer here in the South. If a lunch with the girls does not work, I also would try moving a couple of dinning room chairs - easy to move back if you don't like. I had a similar situation on the lower level of our long narrow family room! I wanted my heirloom dining table and chairs...but I felt that it was heavy on the far end. I brought the oak bench from the bottom of the bed downstairs and put it on the side nearest the living room area. What a difference!!! The backs of the chairs were cutting off the flow of the room. Almost like a barrier or divider. Rearranging is an art. Just don't be afraid to try something different! Your home always looks lovely to me, but I totally get where you're coming from! One more thought--I love any kind of coffee table, wood, glass, metal, all of them. However, I started using a glass coffee table, which really expands the room because your eyes go right through it. You room is lovely but I understand that we all get the urge to change things up a bit. Especially when we see so many ideas on the blogs. I like the idea of some creamy sheers or curtains. Someone mentioned a glass top cocktail table instead of solid wood. Blending in some lighter color, maybe with a rug or pillows. Marty: I love, love, love your style. My thoughts are that you need a little more green. 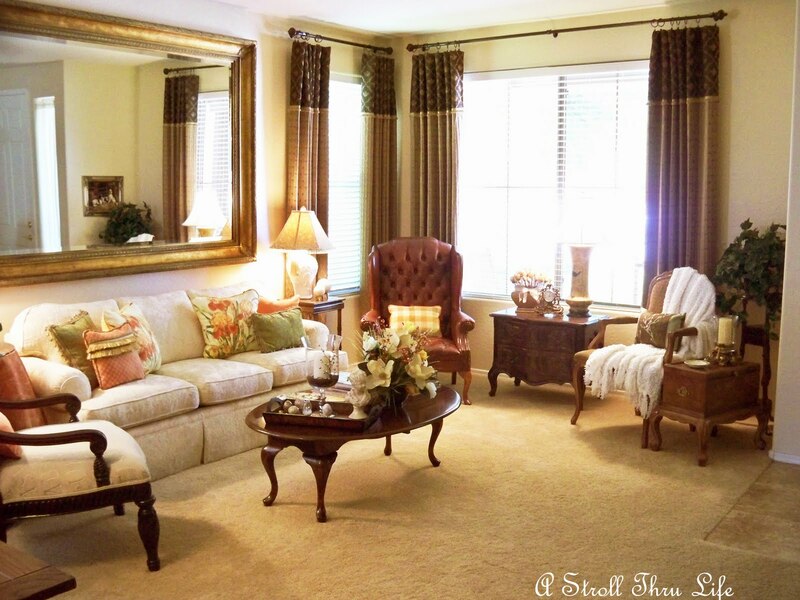 When I look at the photos of your rooms, I see tan, brown and desert tones predominating. I don't have a blog, and I'm not a decorator, but I add extra plants in summer. I remove most of my usual stuff, and plants and shells to what I keep. I used to reserve my silver items for the holiday season, but I have enjoyed the effect of seashells and silver this summer, along with an extra plant or two. I know whatever you do, it will be beautiful! Usually we are the really hot zones, but they sure have had the heat up north this year. You of course are landlocked so I can understand you really wanted something cooler visually. I too like the idea of switching the chairs so that the two by the window are closer in weight and size. And just one table between them is enough and will lighten up that area. 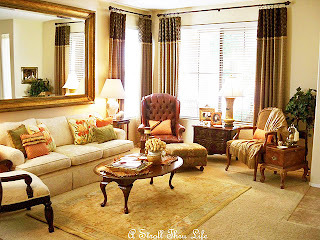 Having drapes to change with the seasons is a great idea and you will love being able to change them with the seasons or on a whim. The coffee table is very dark and again weighty visually if you are trying to make things lighter. An ottoman that complements your sofa, or a white washed chest would go nicely there. And add a couple of nice live plants like a philodendron or peace lily, and that will help cool the look as well. As so many others have said, its lovely as is.. I do understand wanting a change though.. I think I read a comment about 1 painted piece of furniture, and I think that might add some spark. Perhaps you could try the room Without drapes:) just for a few days and see if that makes the room feel lighter to you. They could go back up in late fall for the holidays- OR- not , whichever you choose. good luck and if it says just as it is- its Lovely and a room anyone would be happy to walk into. A large, decorative mirror on one wall would open it up. I agree with one of the earlier comments that said she thought you need to go out for the day, have some lunch with girlfriends & go shopping. We all get bored with our decor. If you want to open it up I think you can remove the table under the dining room window. That would open that area up. The lighter drapes you described sound divine. Maybe paint one of the smaller tables in your living room in a lighter color, or the chairs around the dining room table - like Kim over at SSS. Remove some of the smaller items and think less items, but add ones that are larger in scale - that would give you the feeling of a more open space. October is along time to withstand the heat. I hope it gets here in a hurry for your sake :) Think cool thoughts! I would move the wall mirror in the living room on to the dining room wall (where the floral painting is now). The mirror would then reflect the opposite-wall window (and the light it allows) and it would also fool the eye into thinking the room is larger as you come through the front door. Also, a glass coffee table would make the living room more open. Just my little take on it...but it wouldn't have occurred to me if you hadn't asked the question. It's a lovely room. Marty, I love your blog because it is real!!! You have quality furniture, you stay up to date without changing everything. It is reassuring to know that there you are out there with your classic stylish decor! I like your room, but then again, I tend to change a room with the seasons. So I understand your need for "change". There have been some really good suggestions. You're on the right track. There are a couple of ways you can lighten up the room. 1. Swap the wingback with the white chair. It's a real focal point in the rooom. 2. lightly sand the chest and give it a whitewash of paint. Or if you don't want to do that, Craigslist one and move the other to another room. 3. Replace the tablecloth on the round table with a light color, or antique linen. There's lots of cheap stuff on ebay. 4. You have fabulous cream china on the wall in the dining room. Continue that with cream / white centerpieces on your new linen runner :) on the table. Replace the candlesticks with whitewashed ones. 5. Are you trying to lighten the dining room? There are lots of blogs that make simple chair slipcovers, some out of a linen or sheer fabric would be fun for a summer look! Just think how fun it will be to take them off when it turns cold and you want "cozy". Your room is great! You'll have to share what you decided to do. I hope just re-arranging makes the difference you're looking for! Checkout this blog, there's a wingback with a white slipcover on it, not very tailored, but you it might work for you! Everything you do is beautiful....but I know what you are feeling and saying....this summer heat has had me cooped up for so long I just want to scream!!! I like the idea of the mirror in the dining room, would reflect the light from the opposite windows. And candles lit on the table would also reflect in the evening. Sheer panels are a plus. remove a couple dining room chairs, I also did that and what a difference!!! Glass coffee table and cover the dark wing chair. I also find in the heat that less is more....I have also put away lots of little display pieces and am using crystal and silver. Talk about cabin fever!!! Marty, I think your rooms are gorgeous as is! You've received fun suggestions by your readers ... look forward to seeing what you do! Your room was just lovely before but I do understand. I've done the same to some of my rooms. It's so terribly hot. Changed a guest room to all white and thinking of changing another. I love your house. It looks so warm and friendy.You can come and work on my house.